Every Urgency Based Selling® program and service embodies five fundamental concepts. 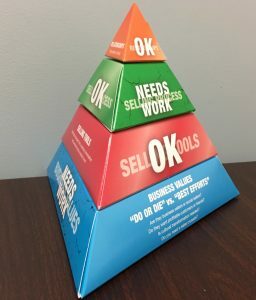 This pyramid of integral ideas also serves as your foundation — a consistent reference point — to support your sales organization through the change process as you implement Urgency Based Selling®. Explore these essential sales concepts. Then learn more about how your sales team can utilize them as part of a customized Urgency Based Selling® program, to achieve epic results. Click each fundamental concept slice on the pyramid below to discover its meaning and importance. Click the slice again to close it. Sales managers gain an entrepreneurial mindset with Urgency Based Selling® sales management training. This new mindset transforms your company’s sales culture with a bold vision for the sales process and bold leadership behavior. This inspires your sales team to define their own paths to success and sell with powerful confidence. so they answer our consultative questions. Success does not come from “doing your best.” For your sales team, best efforts mean failure. Developing the opportunity and closing the sale is a moment of do-or-die. Your salesperson must make the deal now or the sale is gone forever – time kills deals. Learn more about Urgency Based Selling®, a different approach to sales training and changed behavior. Develop a go-getter, entrepreneurial mindset within your sales people and realize epic sales in record time. Provide these fundamental concepts of Urgency Based Selling® to your team. Realize extraordinary sales outcomes. Tell me more about the elements of a customized Urgency Based Selling® program for my company. I want to achieve epic sales results as soon as possible. Connect me with Urgency Based Selling® creator Andy Gole now, so we can get started. Own the actual Urgency Based Selling® pyramid! Please fill out all of the information below and we will send you an Urgency Based Selling® pyramid. C Suite executives can use the 3 Dimensional Urgency Based Selling Pyramid as a visual metric to keep your selling system in control. Turn the sides of the pyramid to indicate which areas, if any, require work.